The record is made up of Codex A collection of pages, usually gathered into quires, and bound between covers. ; ff. iv+68+iv. It was created in 15 Rabī‘ I 709. It was written in Arabic. The original is part of the British Library: Oriental Manuscripts. Treatise on mathematical geography for cartographers by Suhrāb (سهراب; see f. 3, line 1) composed between between 902 and 945 (see LeStrange, 'Description of Mesopotamia and Baghdād', Journal of the Royal Asiatic Society , p. 2). The full title as given on the title page (f. 2r) is Book of the Wonders of the Seven Climes to the Ends of the Inhabited World; How the Cities Are Arranged, the Seas Surround Them and Their Rivers Bifurcate; Knowledge of Their Mountains and Valleys, Roads and Paths by Sea and Land, and All that is Beyond the Equator; Longitude and Latitude by Means of the Ruler, Calculation and Enumeration; A Study of All that is Mentioned Clearly (كتاب عجائب الأقاليم السبعة إلى نهاية العمارة وكيف هيئة المدن وأحاطة البحار بها وتشقق أنهارها ومعرفة جبالها وأوديتها وطرقها ومسالكها في بحرها وبرّها وجميع ما وراء خط الاستوا والطول والعرض بالمسطرة والحساب والعدد والبحث على جميع ما ذكر بجلاء). According to the colophon Section at the end of a manuscript text. 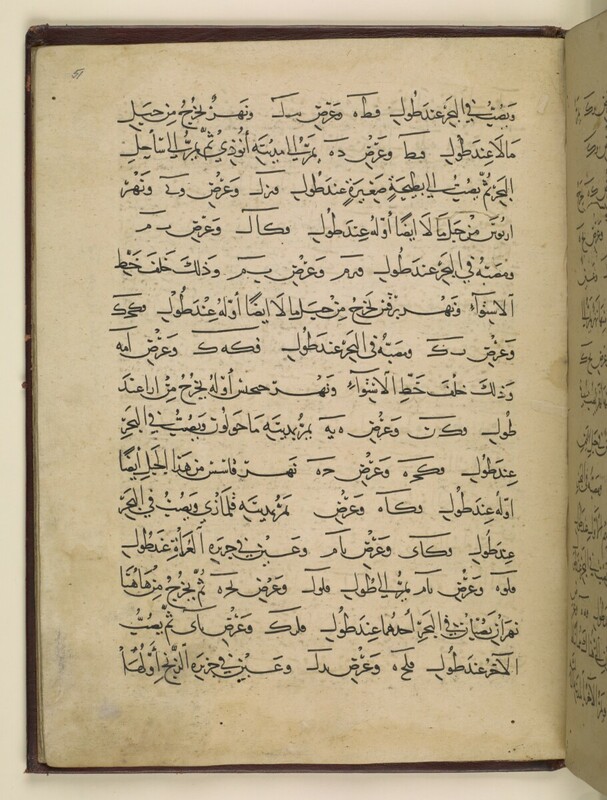 (f. 67v, lines 4-8, transcribed below), this copy was made from the copy of a copy of a correct copy that Ibn al-Warraq (ابن الوراق, probably the bibliographer Ibn al-Nadīm [ابن النديم], d. ca 995) said was in the handwriting of the Syriac bishop and lexicographer al-Ḥasan ibn Bahlūl (الحسن ابن بهلول, called here ابن البهلول, better known by his Syriac name Bar Bahlul [ܒܪ ܒܗܠܘܠ]; fl. 10th century) translator from Syriac into Arabic of the Kunnāsh , or medical compendium, of Ibn Serapion (ابن سرابيون; fl. 9th century). Due to the mention of Ibn Serapion in the colophon Section at the end of a manuscript text. , scholars have often attibuted this work to Ibn Serapion. The colophon Section at the end of a manuscript text. does not, however, mention Ibn Serapion in order to identify the author of the ‘Ajā’ib al-aqālīm al-sab‘ah , but rather to identify Bar Bahlūl. Furthermore, since the physician Ibn Serapion is thought to have written his Kunnāsh in 873, while the geographer Suhrāb is thought to have written the ‘Ajā’ib al-aqālīm al-sab‘ah some time between 902 and 945, it is not likely that these two books are the works of the same author (see Ullmann, Die Medizin im Islam [Leiden: Brill, 1970], p. 102 and LeStrange, 'Description of Mesopotamia and Baghdād', Journal of the Royal Asiatic Society , p. 2). This copy was completed on 15 Rabī‘ I 709/23 August 1309 by an unnamed scribe (see colophon Section at the end of a manuscript text. , f. 67v, line 7, transcribed below). It was the only copy known to the editors of the ‘Ajā’ib al-aqālīm al-sab‘ah , Mžik and LeStrange, who were unaware of Or. 10975. Illustration of the Citidel of Sārūs ibn Kandamān (قلعة ساروس ابن كندمان), apparently not drawn by a professional illustrator, but by the scribe who added the rubricated headings and overlinings on ff. 2v-10r. The text is followed by a poem of eight lines (f. 68v) entitled The Great Reckoning of Praise, a Poem Written Above the Head of the Prophet (حساب الحمد الكبير قصيدة مكتوبة فوق رأس النبي), copied, according to a marginal note, by Murād ibn al-Ḥāj (مراد ابن الحاج).